Apple's lowest-cost notebook starting at $1,199, now with a Retina display and Touch ID. Subscribe for regular MacRumors news and future MacBook Air info. 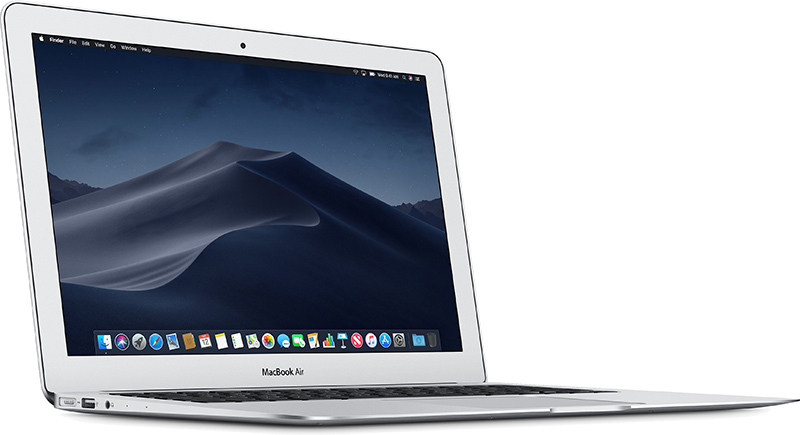 Apple in October 2018 released an entirely overhauled 13-inch MacBook Air machine, introducing the first major update to its lower-cost notebook lineup since 2015. With more than 4 million pixels and a resolution of 2560x1600, the MacBook Air's display offers 48 percent more color than the previous model for more lifelike images. At the top of the display, there's a FaceTime HD camera and a three microphone array for better sound. Design wise, Apple has kept the same tapered wedge-shaped MacBook Air body, but the machine is 10 percent thinner, takes up 17 percent less volume, and weighs a quarter pound less at 2.75 pounds. Apple says the MacBook Air's enclosure is made from an Apple-designed aluminum alloy that uses 100 percent recycled aluminum. For the first time, the MacBook Air comes in multiple color options, with Space Gray, Silver, and Gold machines available for purchase. The MacBook Air adopts a few features from the MacBook Pro, including the third-generation Butterfly keyboard and a larger Force Touch trackpad. There are new speakers that are 25 percent louder with fuller sound and more dynamic range. Like the MacBook Pro, the new MacBook Air includes a T2 chip and a Touch ID fingerprint sensor to use in lieu of a password. The T2 chip is designed to make the MacBook Air more secure with an SSD controller for on-the-fly data encryption and a Secure Enclave to ensure a secure boot process. Through the T2 chip, always-on "Hey Siri" functionality is available. 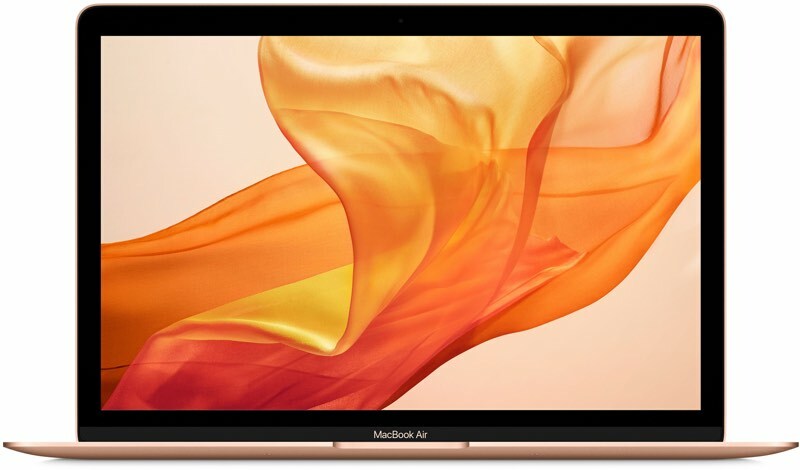 The MacBook Air is equipped with a 1.6GHz 7W Y-Series Amber Lake chip from Intel that supports Turbo Boost up to 3.6GHz, and with the new lower-power higher-efficiency processor, the MacBook Air battery lasts longer than ever with up to 12 hours of web browsing and 13 hours of movie playback. Apple's new machine uses integrated Intel UHD Graphics 617, but with two Thunderbolt 3/USB-C ports, it also works with Thunderbolt 3 eGPUs and supports one 5K display or two 4K displays. The MacBook Air supports up to 16GB RAM and up to 1.5TB of solid state storage, but the base model comes with 8GB RAM and a 128GB SSD. The SSDs in the MacBook Air are up to 60 percent faster than the previous generation. Pricing on the MacBook Air starts at $1,199, $200 more than the previous-generation MacBook Air, which Apple is continuing to sell as a low-cost option. The MacBook Air can be purchased from Apple's online store and from Apple retail stores around the world. Ahead of the launch of the updated 2018 MacBook Air, Apple sent review units to multiple media sites, and we've gathered up a selection of reviews on the various features of the new machine below. Reviews for the 2018 MacBook Air were primarily positive, highlighting the Retina display, the solid performance that's ideal for everyday work tasks, and other upgrades over previous-generation models. The MacBook Air is the laptop for most people, according to reviewers, but the new version doesn't mark a revolutionary update. I tested a unit with Intel's Core i5 processor, which is sold in the entry-level model. I once bought and returned the smaller MacBook, because it comes with a less powerful processor that became sluggish when I had too many browser tabs and apps open. The MacBook Air doesn't have that issue. However, if you want to do professional video editing, you may want to consider Apple's MacBook Pros, which have more muscle under the hood. That's a lot of chip speak, but here's what it really means: If you're someone who builds graphics, edits 4K videos, or processes large photos for a living, the Air isn't going to cut it. It will, however, handle 15 to 20 browser tabs at once, let you edit photos in Lightroom without any hiccups, and keep ten apps running smoothly at once. I know because I'm doing all of this right now as I type. So let me just bottom line it: this new MacBook Air is faster than the old MacBook Air, but not by the kind of margin you'd expect after three years (or even one, if you happened to buy the 2017 model). You can do all of the same stuff you can do on your current Air. I have been running a half-dozen apps at a time along with more than a dozen tabs in Chrome, and everything is pretty okay. I think for what most people will do with this laptop, it's fine. It only has two ports, both USB-C Thunderbolt, so you'll likely need to purchase several dongles. The loss of the SD card slot, in particular, will be tough to accept for anyone who has appreciated the convenience of offloading photos on the older model. For a lot of people, especially those who don't rely on cloud-based storage, the base MacBook Air with 128GB of storage also probably won't be enough. The widescreen display spanning right to the edges of the monitor made for a real movie-like experience, with rich colors and crystal clear, textured definition. And the audio -- with twice the amount of bass as the last version -- made for more of an immersive experience than I've ever had on a laptop, thanks especially to its speakers on either side of the keyboard. The display is excellent even if it's not Apple's best. 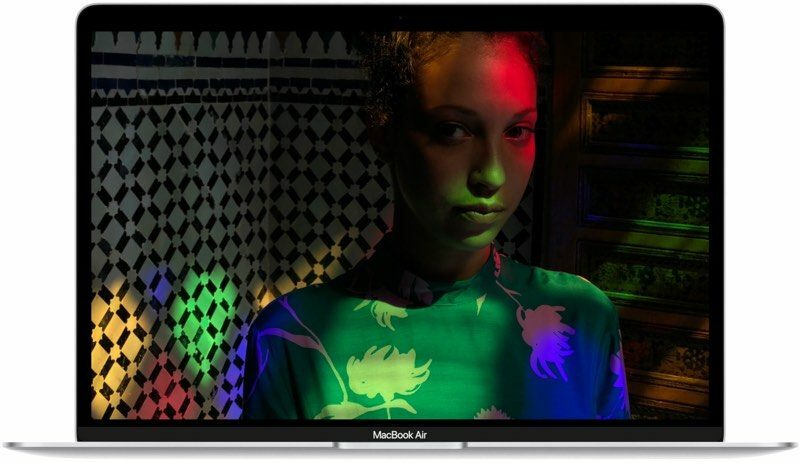 MacBook Pro displays offer 500 nits of maximum brightness; the new MacBook Air offers only 300 nits, according to Apple. MacBook Pros also offer wide color gamut (P3), and the models with the Touch Bar also offer True Tone. They also start at $1,800. Everyone who's been waiting for a retina MacBook Air should be pleased by this display -- it's sharp, accurate, well-balanced, and more than bright enough. What might push you towards the Air, though, more so than any other Mac laptop, is its battery life. The MacBook Air has long been known for its "all-day" battery life. If your work day is around eight-hours, then sure. Battery, meanwhile, is a pretty sizable bump over the MacBook, owing to the larger footprint on the Air's 13.3-inch frame (versus the 12-inch MacBook), with a stated "up to 12 hours" on a charge to the MacBook's 10. I found that to be pretty on the money, in my own testing. I was able to stream video for just a hair under 12 hours -- plenty enough to get you through most flights. The form factor is just about perfect. It's noticeably thinner and lighter than a 13-inch MacBook Pro and noticeably more modern-looking than the old Air. One thing that Apple doesn't get enough credit for in their latest notebooks is the quality of the display hinge. Metal now, not plastic, these hinges have just the right amount of resistance -- they're easy to open, easy to close, and easy to adjust to the perfect viewing angle. This laptop feels a lot nicer than the old MacBook Air. It fits the same size screen in a smaller body, but it's not as thin or as light as the thinnest and lightest of laptops you can get today. When the first Air came out, it amazed everybody. This one, though very well-built, does not stand out from the pack when it comes to size or weight. The result is that this is a 13-inch Air, but it's a lot smaller than the old model--not quite the size of the old 11-inch Air, but closer than you might imagine. As a longtime user of that 11-inch model who always felt the 13-incher was a bit too large, this MacBook Air feels a lot nicer. It's easy to understand Apple's intention to drag the world kicking and screaming into the USB-C era, but it feels premature, particularly on its least expensive mass-market laptop. The fact of the matter is, almost everyone who buys the new Air is going to have to shell out for at least one dongle, if not more. The MacBook Air sports two speedy Thunderbolt 3 ports (which enable much faster data-transfer speeds) on its left side, with a headphone jack on its right. That might be an upgrade from the MacBook's singular, slower USB Type-C port, but it's lacking in comparison to most competitors. 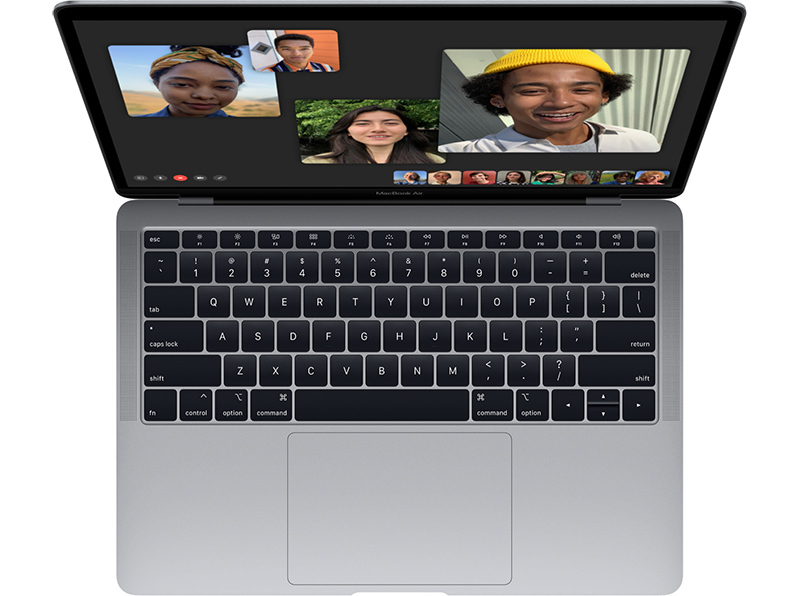 There have been multiple complaints about the quality of the FaceTime HD Camera in the 2018 MacBook Air models, and in testing by MacRumors, we confirmed that the camera in the 2018 model does indeed appear to be worse than the camera in the prior model. That said, all 720p cameras leave something to be desired, and the FaceTime HD Camera is in the MacBook Pro is also rather unclear and grainy. Apple has not commented on the MacBook Air's camera quality despite numerous complaints. Available in three colors for the first time - Silver, Space Gray, and Gold - the new 13.3-inch 2018 MacBook Air is a refined version of the MacBook Air that's been around for years. The new model is thinner and lighter, and it's made from a new Apple-designed aluminum alloy that uses 100 percent recycled aluminum. Design wise, the MacBook Air continues to feature its traditional wedge shape, tapering from thick to thin towards the front of the device. The new MacBook Air design takes up 17 percent less volume and it's 10 percent thinner. At its thickest point, the MacBook Air measures in at .61 inches, and at its thinnest point, it measures in at 0.16 inches. It's 11.97 inches long and 8.36 inches wide. The new version is also a quarter pound lighter than the previous model, weighing in at 2.75 pounds. New to the MacBook Air is a refreshed display that's Retina for the first time, with a higher resolution, and around that display, there are much slimmer black bezels much like the MacBook or the MacBook Pro. Prior models had stark silver bezels, but the new model's bezels are sleeker and better blend into the display. Apple says the bezels are 50 percent thinner than before. Apple added the third-generation butterfly keyboard used in the MacBook Pro to the MacBook Air, which offers a more precise and responsive typing experience than previous keyboards. There has been some controversy with the failure rates of butterfly keyboards, but the third-generation model has extra silicone protection to keep crumbs from damaging the key hardware. Each key has individual backlighting for more accurate illumination in low lighting conditions. 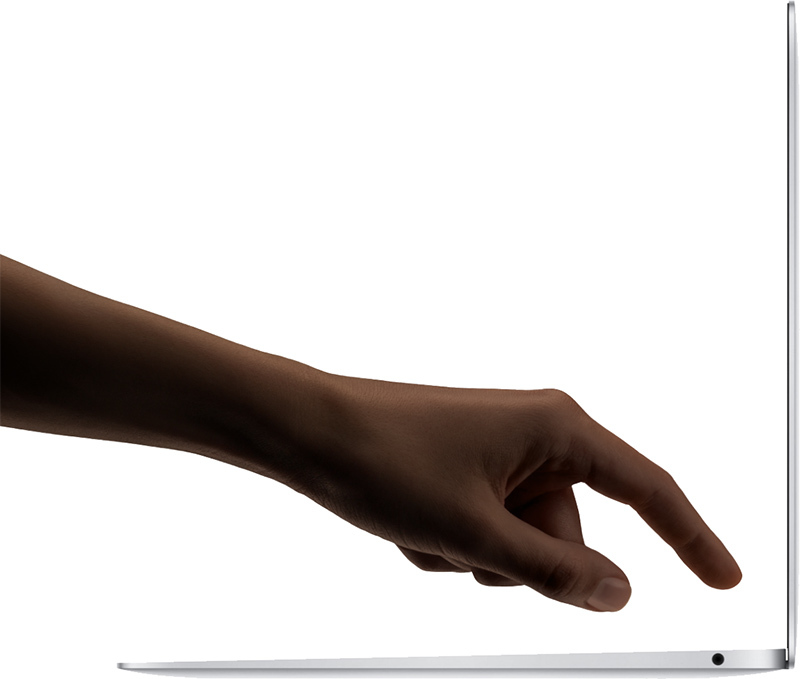 The MacBook Air includes a larger Force Touch trackpad much like the MacBook Pro. Compared to the previous-generation MacBook Air, the trackpad on the 2018 model is 20 percent larger. Two USB-C Thunderbolt 3 ports are included in the MacBook Air, an upgrade from the single USB-C port available on the 12-inch MacBook. With Thunderbolt 3, the MacBook Air can support 4K and 5K displays and connect to eGPUs for faster graphics capabilities when necessary. Thunderbolt 3 supports transfer speeds of up to 40Gb/s, while in USB-C mode ports support USB 3.1 Gen 2 transfer speeds of up to 10Gb/s. Along with the two Thunderbolt 3 ports, there's a 3.5mm headphone jack on the other side of the device. Other than that, there are no additional ports on the MacBook Air, with Apple having removed the USB-A ports and SD card slot. Apple's 2018 MacBook Air features a Retina display that's much sharper, crisper, and clearer than the previous-generation display. It has a 2560 by 1600 resolution with 227 pixels per inch and more than 4 million pixels in total. The display offers 48 percent more color than the previous generation for more lifelike, true to life colors. The MacBook Air is equipped with a 1.6GHz dual-core processor with Turbo Boost up to 3.6GHz. It's a 7W Y-Series Amber Lake chip from Intel, which is a departure from the 15W U-Series chips that were used in previous-generation MacBook Air machines. There is only one chip option for the MacBook Air, which is a bit unusual as Apple typically offers several chip upgrade options for its machines. In Geekbench benchmarks, the MacBook Air earned a single-core score of 4248 and a multi-core score of 7828. Performance has improved over the previous-generation MacBook Air and it's faster than even the fastest 12-inch MacBook, but can't compare with MacBook Pro performance. Comparison info displaying the Geekbench scores of the 2018 MacBook Air compared to other MacBook Air, MacBook, and MacBook Pro machines is below. Geekbench benchmarks aren't necessarily indicative of real-world performance, but it gives us some idea of how the MacBook Air fits into Apple's Mac lineup. As for graphics, the MacBook Air uses integrated Intel UHD Graphics 617, and it can also connect to eGPUs. 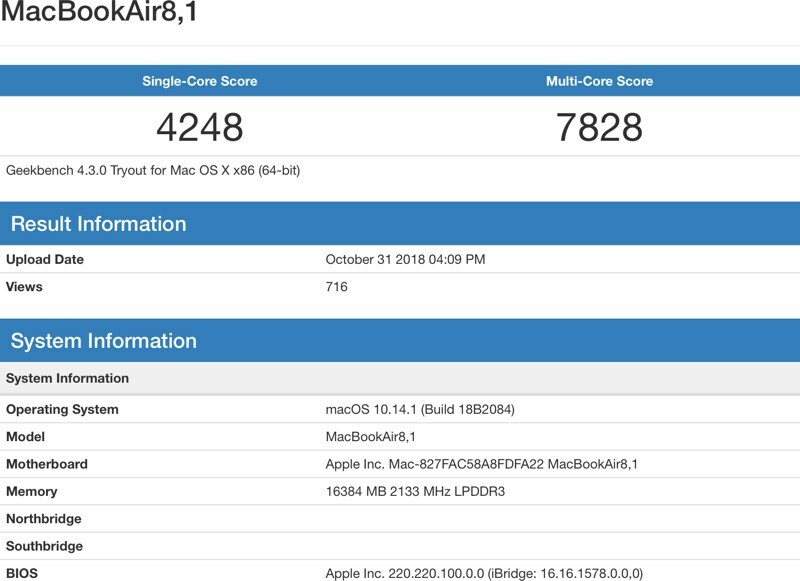 A mystery Geekbench result for an unreleased Mac with a dual-core eighth-generation Core i7 processor with a 1.8GHz clock speed was spotted shortly after the launch of the MacBook Air, suggesting Apple perhaps prototyped a variant with an upgraded processor. A machine with a faster processor did not launch suggesting Apple scrapped it or is planning to launch it as an upgrade option at some point in time. Base models of the MacBook Pro ship with 8GB 2133MHz RAM, but it can be customized with up to 16GB RAM. 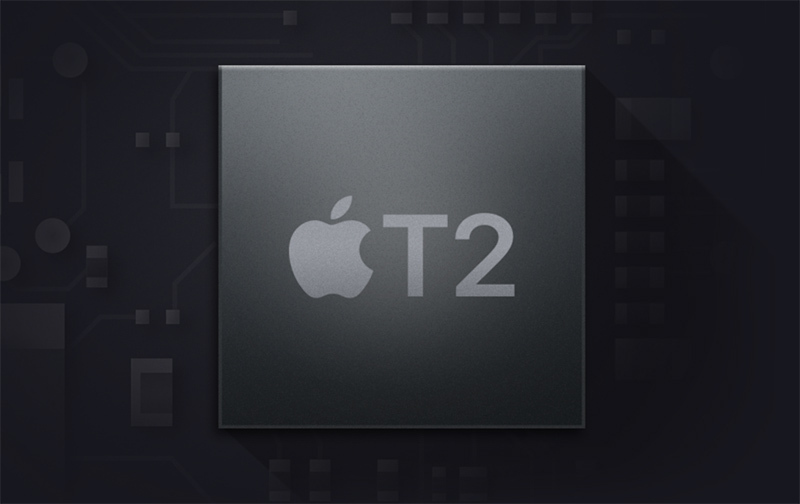 Apple is slowly adding a super secure T2 chip to all of its Macs, and following the MacBook Pro and the iMac Pro, the MacBook Air is the latest machine to be updated with the T2. The T2 chip has a built-in Secure Enclave to protect your Touch ID information, and it also offers on-the-fly data encryption for everything stored on your SSD. The chip is also designed to make sure software loaded when booting up your Mac hasn't been tampered with and is free from malware. In addition to these security features, the T2, which is a separate little chip in your MacBook Air, enables an always-on "Hey Siri" feature so it listens for the "Hey Siri" command and there's no longer a need to click on the Siri button to activate Siri. 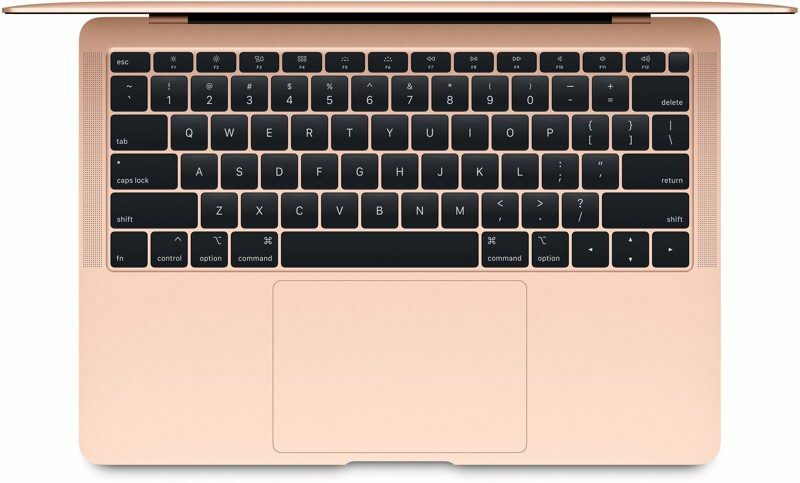 The new MacBook Air adopts a MacBook Pro feature - Touch ID. Next to the function keys at the top of the keyboard, there's a sapphire crystal-covered Touch ID fingerprint sensor. Touch ID on the MacBook can be used instead of a password, unlocking the Mac when a finger is placed on the sensor. It also replaces a password for password protected apps, and it can be used to make Apple Pay purchases in Safari. Touch ID is powered by the T2 chip with a Secure Enclave that keeps your fingerprint data and personal information safe. Apple's 2018 MacBook Air features the best battery life of any Mac notebook. There's a built-in 50.3-watt-hour battery inside. The battery lasts for up to 12 hours when browsing the web and up to 13 hours when watching iTunes movies. The battery in the MacBook Air is easier to replace and does not require the entire top case to be replaced as is the case with the MacBook and MacBook Pro. Apple ships the MacBook Air with a 30W USB-C Power Adapter that's used to charge it. The MacBook Air supports 802.11ac Wi-Fi and Bluetooth 4.2. New speakers in the MacBook Air are 25 percent louder than the speakers in the previous model with two times more bass for more dynamic range and fuller sound. A three microphone array allows for better sound quality for video and audio calls. There's a 720p HD camera built into the front of the MacBook for FaceTime calls. The MacBook Air uses solid state storage with capacities up to 1.5TB. Apple says the SSDs in the device are up to 60 percent faster than the SSDs in the previous-generation model. $1,199 - 1.6GHz dual-core Intel Core i5 processor, Intel UHD Graphics 617, 8GB RAM, 128GB SSD. $1,399 - 1.6GHz dual-core Intel Core i5 processor, Intel UHD Graphics 617, 8GB RAM, 256GB SSD. The RAM and SSD capacity can be customized when purchasing a 2018 MacBook Air. There are no upgrade options for processor or graphics, but Apple did drop the prices on some of the higher-level upgrades in March 2019. A top-of-the-line MacBook Air with a 1.6GHz processor, 16GB RAM, and 1.5TB SSD will cost $2,499. Apple is still selling the 2017 MacBook Air that uses an outdated 1.8GHz dual-core 5th-generation Broadwell processor from Intel. It is one of the last machines to offer MagSafe for charging, USB-A ports, and an SD card slot. This machine is using hardware from 2015, and it is Apple's lowest-cost option at $999. It is generally not worth purchasing for most people given the outdated hardware, but it continues to be a capable machine for doing things like browsing the web, answering emails, and light app use. We compared the 2018 MacBook Pro to the older MacBook Pro to see if there's any reason to buy the older model, but if you can afford it, shelling out the extra $200 is well worth it because the new MacBook Air is better than the old version in every way. Apple's new 2018 MacBook Air is its lowest cost modern notebook at $1,199, but at that price point, it's not too far off from the MacBook or the MacBook Pro sans Touch Bar. Many reviewers agree that the MacBook Air is the machine to get for most people due to its long battery life, decent processor speed, lower price tag, and advanced features like Touch ID and a T2 chip for security. Right now, the MacBook Air is faster than even the highest-end 12-inch MacBook (which didn't get a 2018 update) and it has a better feature set, but it's still heavier and thicker than the MacBook. If you want the ultimate in portability and don't mind sacrificing some processor power, the MacBook is the machine to get. When and if the MacBook Air receives another update, there will be fewer differences between the two machines. The MacBook Air is ideal for tasks like word processing, light creative work and editing, web browsing, watching movies, office work, and similar jobs, but if you need more processing power for things like 3d rendering, video editing, and other system intensive tasks, you're going to want one of the 13 or 15-inch MacBook Pro models with Touch Bar, as those machines are much more powerful than the MacBook Air. With more power comes a higher price tag, of course, and those machines are going to start at $1,799. Apple does sell non-Touch Bar 2017 13-inch MacBook Pro machines that start at $1,299, but the performance is very similar to the MacBook Air so the extra cost and may not be worth it. 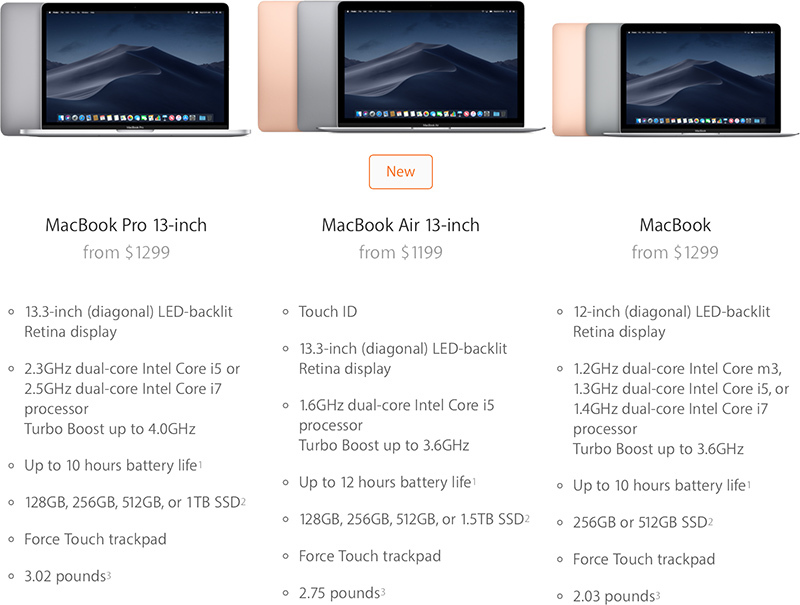 To see a more in-depth side-by-side comparison of Apple's MacBook, MacBook Air, and MacBook machines, check out the compare feature on Apple's website. The MacBook Air can be purchased from the Apple online and retail stores. 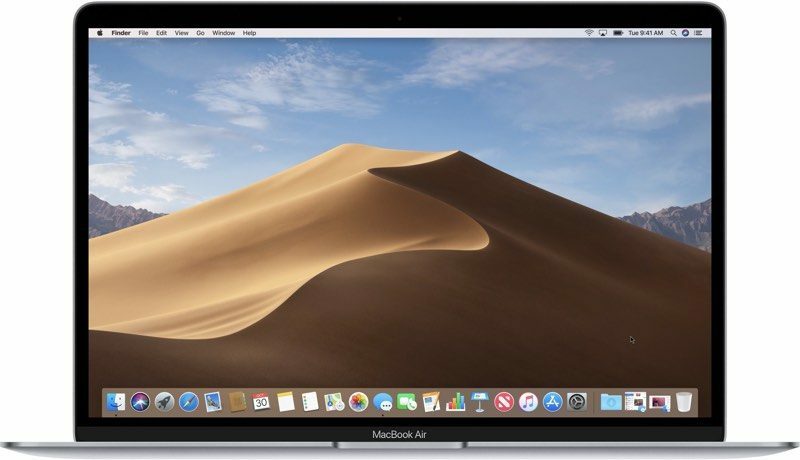 It is also available from third-party retailers, and as of January 2019, Apple is selling discounted 2018 MacBook Air models in its online store for refurbished products.